Cameroon woke up on Friday morning with a thirst for news about their fallen hero Marc Vivien Foe. As soon as the news-stands opened for business, they were filled with people who crowded round to read the headlines. The daily newspapers are dominated by the imagery of the 'war' hero - they describe a man struck down in his prime while in the service of his country. Le Messager is one of Cameroon's most widely read French language newspapers. Its front page carries a picture of Foe as he is carried off the pitch on a stretcher under the headline "Le Sacrifice Supreme" (The Ultimate Sacrifice). Inside it dedicates several pages to Foe saying that he was indomitable to the end. The Cameroon Tribune, a state owned bilingual daily had "Foe qualifies and bows out" as its lead, which summed up the mood of the people. Cameroon's writers agree that the victory over Colombia has brought bring little pleasure to the players or the fans, as they mourn Foe's death. Inside the Tribune is a rather poetic commentary by Peter Mabu Shey who evokes the great war poets and even Shakespeare in his column. "It is an honour indeed to die in a battle which has been won by your country," he says. "The good deeds done on the stage live for ever even after the curtain falls". 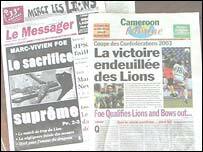 Cameroon's daily newspapers went to print before it was confirmed that the Lions would play Sunday's final against France. But thev papers are unanimous in their verdict that the Indomitable Lions should fight the next battle and win the Confederations Cup in the name of Marc Vivien Foe.